where is the species- gyroradius. where is a non-zero integer. These resonances are a finite gyroradius effect. In fact, they originate from the variation of the wave phase across a gyro-orbit (Cairns 1985). Thus, in the cold plasma limit, , in which the gyroradii shrink to zero, all of the resonances disappear from the dispersion relation. In the limit in which the wavelength, , of the wave is much larger than a typical gyroradius, , the relative amplitude of the th harmonic cyclotron resonance, as it appears in the dispersion relation (8.107), is approximately [see Equations (8.88) and (8.106)]. It is clear, therefore, that, in this limit, only low-order resonances [i.e., ] couple strongly into the dispersion relation, and high-order resonances (i.e., ) can effectively be neglected. As , the high-order resonances become increasingly important, until, when , all of the resonances are of approximately equal strength. Because the ion gyroradius is generally much larger than the electron gyroradius, it follows that the ion cyclotron harmonic resonances are generally more important than the electron cyclotron harmonic resonances. Thus, the cyclotron harmonic resonances possess a finite width in frequency space provided the parallel wavenumber, , is non-zero: that is, provided the wave does not propagate exactly perpendicular to the magnetic field. The appearance of the cyclotron harmonic resonances in a warm plasma is of great practical importance in plasma physics, because it greatly increases the number of resonant frequencies at which waves can transfer energy to the plasma. In magnetic fusion experiments, these resonances are routinely exploited to heat plasmas via externally launched electromagnetic waves (Stix 1992; Swanson 2003). 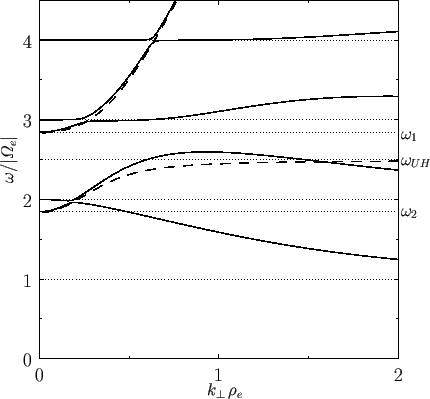 Figure: Dispersion relation for electron Bernstein waves in a warm plasma for which . with the eigenvector . In the cold plasma limit, , this dispersion relation reduces to that of the extraordinary mode discussed in Section 5.10. This mode, for which , unless the plasma possesses a thermal velocity approaching the velocity of light, is little affected by thermal effects, except close to the cyclotron harmonic resonances, , where small thermal corrections are important because of the smallness of the denominators in the previous dispersion relation (Cairns 1985). and the associated eigenvector is . The new waves, which are called Bernstein waves--after I.B. Bernstein, who first discovered them (Bernstein 1958)--are a type of slowly propagating, longitudinal, electrostatic wave. It follows that there is a Bernstein wave whose frequency asymptotes to the upper hybrid frequency (see Section 5.10) in the limit . For other non-zero values of , we have as . However, a solution to Equation (8.111) can be obtained if at the same time. Similarly, as , we have (Abramowitz and Stegun 1965c). In this case, a solution can only be obtained if , for some , at the same time. The complete solution to Equation (8.111) is plotted in Figure 8.8 for a case where the upper hybrid frequency lies between and . In fact, wherever the upper hybrid frequency lies, the Bernstein modes above and below it behave like those shown in the diagram. At small values of , the phase-velocity becomes large, and it is no longer legitimate to neglect the extraordinary mode (Cairns 1985). A more detailed examination of the complete dispersion relation shows that the extraordinary mode and the Bernstein mode cross over near the harmonics of the cyclotron frequency to give the pattern shown in Figure 8.9. Here, the dashed line shows the cold plasma extraordinary mode. 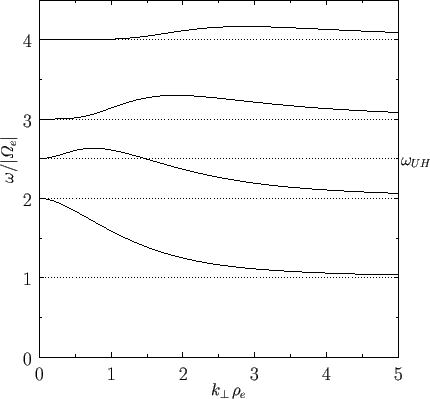 Figure: Dispersion relation for extraordinary/electron Bernstein waves in a warm plasma for which and . The dashed line indicates the cold plasma extraordinary mode. In a lower frequency range, a similar phenomena occurs at the harmonics of the ion cyclotron frequency, producing ion Bernstein waves, with somewhat similar properties to electron Bernstein waves. Note, however, that while the ion contribution to the dispersion relation can be neglected for high-frequency waves, the electron contribution cannot be neglected for low-frequency waves, so there is not a complete symmetry between the two types of Bernstein waves.